Tnorala, or Gosse Bluff, Conservation Reserve is a site of great cultural significance to the local Western Arrernte Aboriginal people. According to belief, the low, circular range of mountains was formed when a woman put her baby in a wooden cradle while she danced across the sky as part of the Milky Way. Forgotten, the carrier toppled to earth and was transformed into the circular rock walls of Tnorala. Scientists believe that the formation occurred when a comet crashed to earth and hardened the land for a six-mile (20 km) diameter before the surrounding earth eroded over time. Whichever story you believe, visiting Tnorala is an awesome sight. A short walk to a lookout on an adjacent ridge gives views into the crater, while a longer loop walk takes visitors higher still to get an even more expansive view. As the traditional owners manage Tnorala, access to the site is in accordance to their wishes. Visitors are not permitted to enter the crater or walk along its rim. 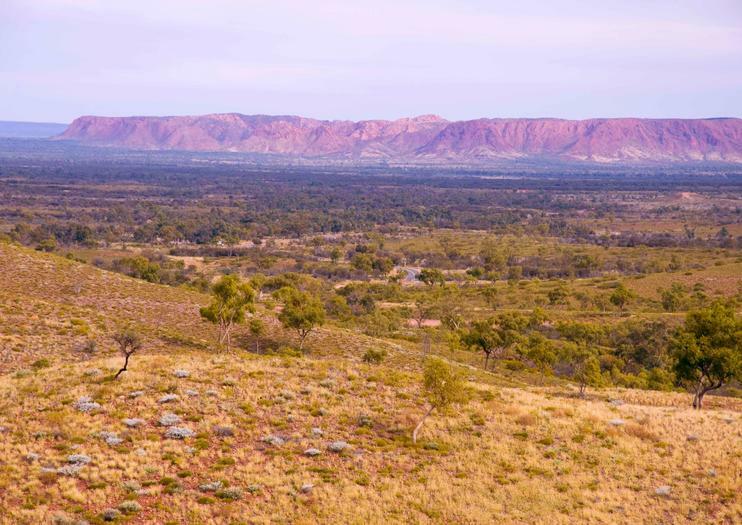 Tnorala Conservation Reserve is located 110 miles (175 km) west of Alice Springs and is only accessible by 4WD. An information spot, picnic tables and bathrooms are available at the site, but camping and fires are not permitted. Depart from Ayers Rock on a scenic 2-hour air tour that soars over Kings Canyon, Lake Amadeus, and the impact crater at Gosses Bluff, which may have been formed by a meteorite crash. Hear informative commentary from the pilot during your flight and get great views from the guaranteed window seat of your fixed-wing plane. Select from a sunrise, morning, or afternoon tour.